The bar in the restaurant has some above average tequila, so I would usually get a shot of something nice to make my food go down a lot easier. They also have a nice area outside to sit, eat, drink, and gossip about all the photographers we know. 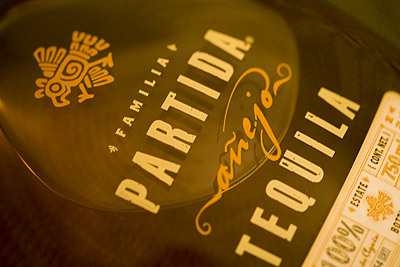 One day during my Partida Añejo phase, I spotted the bottle of it on the bar, so I planned to order it with dinner. I’ve always considered this a great tequila for the money. In most places I could get it for $12 – $14 per shot. A bottle of it costs about $60, which will give you 12.5 two-ounce shots, which means a bar selling out the entire bottle as shots to people like me will make $115 profit on a single bottle. Makes me want to get into the bar business. The waitress came to the table looking like she had a really bad day, or she hated her job, or both. She took our order, and didn’t look happy about it. I asked her for a shot of Partida Añjeo. “What? Patron and what?” she said. “No, not Patron. Partida Añejo. PAR-TEE-DAH AN-YAY-HO,” I replied. “What? We don’t have that. We don’t have anything with that name,” she said. “We don’t have that here. I’ve never served it before, and nobody has ever asked for it,” she said. “You do have it. Trust me. I saw it. Go ask the bartender. If he can’t find it, I’ll come over and point it out for him,” I said. She was really annoyed now, and left the table in a huff, determined to show me that I was wrong. I was considering going up to the bar and ordering it myself, but decided to wait and see what she came up with. When she came back to the table, she was a whole new person. “Yes! We definitely DO have that tequila,” she said with a new eager-to-please attitude. She was polite and attentive and kept coming back to the table to make sure everything was to our liking. I ended up ordering three shots during dinner, and she brought each one to the table with amazing speed. We had a great evening, sitting at the table for a long time, and we weren’t being rushed one bit. Fantastic service! When it came time to leave, we asked for the check. When it arrived, everything suddenly made sense. I never asked anything about the price of those Partida Añjeo shots, but I learned when the check hit the table. The math on that bottle works out to a healthy $390 profit for the bar. Now I REALLY want to get into the bar business. I showed the bill to Brad, laughing. I just spent $108 for beverages, and $12 for the food – as outrageous as this is, and how bipolar the waitress was, I still left her a 20% tip. The story alone was worth it. I have stories EXACTLY like that! Isn’t it fun to stop in your tracks as you enter a restaurant and eye the tequila selection REAL carefully? Everyone looks at you suspiciously… but hey, how else are you gonna know?